As an action potential (nerve impulse) travels down an axon there is a change in polarity across the membrane of the axon. In response to a signal from another neuron, sodium- (Na+) and potassium- (K+) gated ion channels open and close as the membrane reaches its threshold potential. Na+ channels open at the beginning of the action potential, and Na+ moves into the axon, causing depolarization. Repolarization occurs when the K+ channels open and K+ moves out of the axon, creating a change in polarity between the outside of the cell and the inside. The impulse travels down the axon in one direction only, to the axon terminal where it signals other neurons. 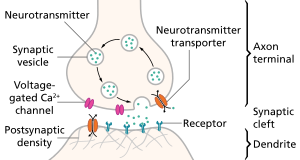 In neurons, action potentials play a central role in cell-to-cell communication by providing for—or with regard to saltatory conduction, assisting—the propagation of signals along the neuron's axon toward synaptic boutons situated at the ends of an axon; these signals can then connect with other neurons at synapses, or to motor cells or glands. In other types of cells, their main function is to activate intracellular processes. In muscle cells, for example, an action potential is the first step in the chain of events leading to contraction. In beta cells of the pancreas, they provoke release of insulin. [a] Action potentials in neurons are also known as "nerve impulses" or "spikes", and the temporal sequence of action potentials generated by a neuron is called its "spike train". A neuron that emits an action potential, or nerve impulse, is often said to "fire". Action potentials are generated by special types of voltage-gated ion channels embedded in a cell's plasma membrane. [b] These channels are shut when the membrane potential is near the (negative) resting potential of the cell, but they rapidly begin to open if the membrane potential increases to a precisely defined threshold voltage, depolarising the transmembrane potential. [b] When the channels open, they allow an inward flow of sodium ions, which changes the electrochemical gradient, which in turn produces a further rise in the membrane potential. This then causes more channels to open, producing a greater electric current across the cell membrane and so on. The process proceeds explosively until all of the available ion channels are open, resulting in a large upswing in the membrane potential. The rapid influx of sodium ions causes the polarity of the plasma membrane to reverse, and the ion channels then rapidly inactivate. As the sodium channels close, sodium ions can no longer enter the neuron, and they are then actively transported back out of the plasma membrane. Potassium channels are then activated, and there is an outward current of potassium ions, returning the electrochemical gradient to the resting state. After an action potential has occurred, there is a transient negative shift, called the afterhyperpolarization. In animal cells, there are two primary types of action potentials. One type is generated by voltage-gated sodium channels, the other by voltage-gated calcium channels. Sodium-based action potentials usually last for under one millisecond, but calcium-based action potentials may last for 100 milliseconds or longer. In some types of neurons, slow calcium spikes provide the driving force for a long burst of rapidly emitted sodium spikes. In cardiac muscle cells, on the other hand, an initial fast sodium spike provides a "primer" to provoke the rapid onset of a calcium spike, which then produces muscle contraction. In the Hodgkin–Huxley membrane capacitance model, the speed of transmission of an action potential was undefined and it was assumed that adjacent areas became depolarised due to released ion interference with neighbouring channels. Measurements of ion diffusion and radii have since shown this not to be possible. Moreover, contradictory measurements of entropy changes and timing disputed the capacitance model as acting alone. Shape of a typical action potential. The membrane potential remains near a baseline level until at some point in time, it abruptly spikes upward and then rapidly falls. Nearly all cell membranes in animals, plants and fungi maintain a voltage difference between the exterior and interior of the cell, called the membrane potential. A typical voltage across an animal cell membrane is −70 mV. This means that the interior of the cell has a negative voltage of approximately one-fifteenth of a volt relative to the exterior. In most types of cells, the membrane potential usually stays fairly constant. Some types of cells, however, are electrically active in the sense that their voltages fluctuate over time. In some types of electrically active cells, including neurons and muscle cells, the voltage fluctuations frequently take the form of a rapid upward spike followed by a rapid fall. These up-and-down cycles are known as action potentials. In some types of neurons, the entire up-and-down cycle takes place in a few thousandths of a second. In muscle cells, a typical action potential lasts about a fifth of a second. In some other types of cells, and also in plants, an action potential may last three seconds or more. The electrical properties of a cell are determined by the structure of the membrane that surrounds it. A cell membrane consists of a lipid bilayer of molecules in which larger protein molecules are embedded. The lipid bilayer is highly resistant to movement of electrically charged ions, so it functions as an insulator. The large membrane-embedded proteins, in contrast, provide channels through which ions can pass across the membrane. Action potentials are driven by channel proteins whose configuration switches between closed and open states as a function of the voltage difference between the interior and exterior of the cell. These voltage-sensitive proteins are known as voltage-gated ion channels. An in-depth process of how an action potential will pass through a neuron during neuron transmission including the 4 stages: resting potential, depolarization, re-polarization, and back to resting potential. The diagram shows how sodium ions and potassium ions interact to show how the changing of charge allows the action potential to cross with the use of facilitated diffusion and active transport. Approximate plot of a typical action potential shows its various phases as the action potential passes a point on a cell membrane. The membrane potential starts out at −70 mV at time zero. A stimulus is applied at time = 1 ms, which raises the membrane potential above −55 mV (the threshold potential). After the stimulus is applied, the membrane potential rapidly rises to a peak potential of +40 mV at time = 2 ms. Just as quickly, the potential then drops and overshoots to −90 mV at time = 3 ms, and finally the resting potential of −70 mV is reestablished at time = 5 ms.
All cells in animal body tissues are electrically polarized – in other words, they maintain a voltage difference across the cell's plasma membrane, known as the membrane potential. This electrical polarization results from a complex interplay between protein structures embedded in the membrane called ion pumps and ion channels. In neurons, the types of ion channels in the membrane usually vary across different parts of the cell, giving the dendrites, axon, and cell body different electrical properties. As a result, some parts of the membrane of a neuron may be excitable (capable of generating action potentials), whereas others are not. Recent studies have shown that the most excitable part of a neuron is the part after the axon hillock (the point where the axon leaves the cell body), which is called the initial segment, but the axon and cell body are also excitable in most cases. Each excitable patch of membrane has two important levels of membrane potential: the resting potential, which is the value the membrane potential maintains as long as nothing perturbs the cell, and a higher value called the threshold potential. At the axon hillock of a typical neuron, the resting potential is around –70 millivolts (mV) and the threshold potential is around –55 mV. Synaptic inputs to a neuron cause the membrane to depolarize or hyperpolarize; that is, they cause the membrane potential to rise or fall. Action potentials are triggered when enough depolarization accumulates to bring the membrane potential up to threshold. When an action potential is triggered, the membrane potential abruptly shoots upward and then equally abruptly shoots back downward, often ending below the resting level, where it remains for some period of time. The shape of the action potential is stereotyped; this means that the rise and fall usually have approximately the same amplitude and time course for all action potentials in a given cell. (Exceptions are discussed later in the article). In most neurons, the entire process takes place in about a thousandth of a second. Many types of neurons emit action potentials constantly at rates of up to 10–100 per second. However, some types are much quieter, and may go for minutes or longer without emitting any action potentials. Voltage-gated ion channels are capable of producing action potentials because they can give rise to positive feedback loops: The membrane potential controls the state of the ion channels, but the state of the ion channels controls the membrane potential. Thus, in some situations, a rise in the membrane potential can cause ion channels to open, thereby causing a further rise in the membrane potential. An action potential occurs when this positive feedback cycle proceeds explosively. The time and amplitude trajectory of the action potential are determined by the biophysical properties of the voltage-gated ion channels that produce it. Several types of channels capable of producing the positive feedback necessary to generate an action potential do exist. Voltage-gated sodium channels are responsible for the fast action potentials involved in nerve conduction. Slower action potentials in muscle cells and some types of neurons are generated by voltage-gated calcium channels. Each of these types comes in multiple variants, with different voltage sensitivity and different temporal dynamics. Ion movement during an action potential. Key: a) Sodium (Na+) ion. b) Potassium (K+) ion. c) Sodium channel. d) Potassium channel. e) Sodium-potassium pump. In the stages of an action potential, the permeability of the membrane of the neuron changes. At the resting state (1), sodium and potassium ions have limited ability to pass through the membrane, and the neuron has a net negative charge inside. Once the action potential is triggered, the depolarization (2) of the neuron activates sodium channels, allowing sodium ions to pass through the cell membrane into the cell, resulting in a net positive charge in the neuron relative to the extracellular fluid. After the action potential peak is reached, the neuron begins repolarization (3), where the sodium channels close and potassium channels open, allowing potassium ions to cross the membrane into the extracellular fluid, returning the membrane potential to a negative value. Finally, there is a refractory period (4), during which the voltage-dependent ion channels are inactivated while the Na+ and K+ ions return to their resting state distributions across the membrane (1), and the neuron is ready to repeat the process for the next action potential. As the membrane potential is increased, sodium ion channels open, allowing the entry of sodium ions into the cell. This is followed by the opening of potassium ion channels that permit the exit of potassium ions from the cell. The inward flow of sodium ions increases the concentration of positively charged cations in the cell and causes depolarization, where the potential of the cell is higher than the cell's resting potential. The sodium channels close at the peak of the action potential, while potassium continues to leave the cell. The efflux of potassium ions decreases the membrane potential or hyperpolarizes the cell. For small voltage increases from rest, the potassium current exceeds the sodium current and the voltage returns to its normal resting value, typically −70 mV. However, if the voltage increases past a critical threshold, typically 15 mV higher than the resting value, the sodium current dominates. This results in a runaway condition whereby the positive feedback from the sodium current activates even more sodium channels. Thus, the cell fires, producing an action potential. [note 1] The frequency at which a neuron elicits action potentials is often referred to as a firing rate or neural firing rate. Although action potentials are generated locally on patches of excitable membrane, the resulting currents can trigger action potentials on neighboring stretches of membrane, precipitating a domino-like propagation. In contrast to passive spread of electric potentials (electrotonic potential), action potentials are generated anew along excitable stretches of membrane and propagate without decay. Myelinated sections of axons are not excitable and do not produce action potentials and the signal is propagated passively as electrotonic potential. Regularly spaced unmyelinated patches, called the nodes of Ranvier, generate action potentials to boost the signal. Known as saltatory conduction, this type of signal propagation provides a favorable tradeoff of signal velocity and axon diameter. Depolarization of axon terminals, in general, triggers the release of neurotransmitter into the synaptic cleft. In addition, backpropagating action potentials have been recorded in the dendrites of pyramidal neurons, which are ubiquitous in the neocortex. [c] These are thought to have a role in spike-timing-dependent plasticity. A neuron's ability to generate and propagate an action potential changes during development. How much the membrane potential of a neuron changes as the result of a current impulse is a function of the membrane input resistance. As a cell grows, more channels are added to the membrane, causing a decrease in input resistance. A mature neuron also undergoes shorter changes in membrane potential in response to synaptic currents. Neurons from a ferret lateral geniculate nucleus have a longer time constant and larger voltage deflection at P0 than they do at P30. One consequence of the decreasing action potential duration is that the fidelity of the signal can be preserved in response to high frequency stimulation. Immature neurons are more prone to synaptic depression than potentiation after high frequency stimulation. In the early development of many organisms, the action potential is actually initially carried by calcium current rather than sodium current. The opening and closing kinetics of calcium channels during development are slower than those of the voltage-gated sodium channels that will carry the action potential in the mature neurons. The longer opening times for the calcium channels can lead to action potentials that are considerably slower than those of mature neurons. Xenopus neurons initially have action potentials that take 60–90 ms. During development, this time decreases to 1 ms. There are two reasons for this drastic decrease. First, the inward current becomes primarily carried by sodium channels. Second, the delayed rectifier, a potassium channel current, increases to 3.5 times its initial strength. In order for the transition from a calcium-dependent action potential to a sodium-dependent action potential to proceed new channels must be added to the membrane. If Xenopus neurons are grown in an environment with RNA synthesis or protein synthesis inhibitors that transition is prevented. Even the electrical activity of the cell itself may play a role in channel expression. If action potentials in Xenopus myocytes are blocked, the typical increase in sodium and potassium current density is prevented or delayed. This maturation of electrical properties is seen across species. Xenopus sodium and potassium currents increase drastically after a neuron goes through its final phase of mitosis. The sodium current density of rat cortical neurons increases by 600% within the first two postnatal weeks. Several types of cells support an action potential, such as plant cells, muscle cells, and the specialized cells of the heart (in which occurs the cardiac action potential). However, the main excitable cell is the neuron, which also has the simplest mechanism for the action potential. Neurons are electrically excitable cells composed, in general, of one or more dendrites, a single soma, a single axon and one or more axon terminals. Dendrites are cellular projections whose primary function is to receive synaptic signals. Their protrusions, known as dendritic spines, are designed to capture the neurotransmitters released by the presynaptic neuron. They have a high concentration of ligand-gated ion channels. These spines have a thin neck connecting a bulbous protrusion to the dendrite. This ensures that changes occurring inside the spine are less likely to affect the neighboring spines. The dendritic spine can, with rare exception (see LTP), act as an independent unit. The dendrites extend from the soma, which houses the nucleus, and many of the "normal" eukaryotic organelles. Unlike the spines, the surface of the soma is populated by voltage activated ion channels. These channels help transmit the signals generated by the dendrites. Emerging out from the soma is the axon hillock. This region is characterized by having a very high concentration of voltage-activated sodium channels. In general, it is considered to be the spike initiation zone for action potentials, i.e. the trigger zone. Multiple signals generated at the spines, and transmitted by the soma all converge here. Immediately after the axon hillock is the axon. This is a thin tubular protrusion traveling away from the soma. The axon is insulated by a myelin sheath. Myelin is composed of either Schwann cells (in the peripheral nervous system) or oligodendrocytes (in the central nervous system), both of which are types of glial cells. Although glial cells are not involved with the transmission of electrical signals, they communicate and provide important biochemical support to neurons. To be specific, myelin wraps multiple times around the axonal segment, forming a thick fatty layer that prevents ions from entering or escaping the axon. This insulation prevents significant signal decay as well as ensuring faster signal speed. This insulation, however, has the restriction that no channels can be present on the surface of the axon. There are, therefore, regularly spaced patches of membrane, which have no insulation. These nodes of Ranvier can be considered to be "mini axon hillocks", as their purpose is to boost the signal in order to prevent significant signal decay. 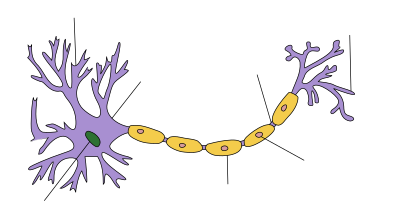 At the furthest end, the axon loses its insulation and begins to branch into several axon terminals. These presynaptic terminals, or synaptic boutons, are a specialized area within the axon of the presynaptic cell that contains neurotransmitters enclosed in small membrane-bound spheres called synaptic vesicles. Before considering the propagation of action potentials along axons and their termination at the synaptic knobs, it is helpful to consider the methods by which action potentials can be initiated at the axon hillock. The basic requirement is that the membrane voltage at the hillock be raised above the threshold for firing. There are several ways in which this depolarization can occur. When an action potential arrives at the end of the pre-synaptic axon (top), it causes the release of neurotransmitter molecules that open ion channels in the post-synaptic neuron (bottom). The combined excitatory and inhibitory postsynaptic potentials of such inputs can begin a new action potential in the post-synaptic neuron. Action potentials are most commonly initiated by excitatory postsynaptic potentials from a presynaptic neuron. Typically, neurotransmitter molecules are released by the presynaptic neuron. These neurotransmitters then bind to receptors on the postsynaptic cell. 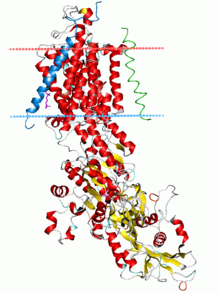 This binding opens various types of ion channels. This opening has the further effect of changing the local permeability of the cell membrane and, thus, the membrane potential. If the binding increases the voltage (depolarizes the membrane), the synapse is excitatory. If, however, the binding decreases the voltage (hyperpolarizes the membrane), it is inhibitory. Whether the voltage is increased or decreased, the change propagates passively to nearby regions of the membrane (as described by the cable equation and its refinements). Typically, the voltage stimulus decays exponentially with the distance from the synapse and with time from the binding of the neurotransmitter. Some fraction of an excitatory voltage may reach the axon hillock and may (in rare cases) depolarize the membrane enough to provoke a new action potential. More typically, the excitatory potentials from several synapses must work together at nearly the same time to provoke a new action potential. Their joint efforts can be thwarted, however, by the counteracting inhibitory postsynaptic potentials. Neurotransmission can also occur through electrical synapses. Due to the direct connection between excitable cells in the form of gap junctions, an action potential can be transmitted directly from one cell to the next in either direction. The free flow of ions between cells enables rapid non-chemical-mediated transmission. Rectifying channels ensure that action potentials move only in one direction through an electrical synapse. Electrical synapses are found in all nervous systems, including the human brain, although they are a distinct minority. The amplitude of an action potential is independent of the amount of current that produced it. In other words, larger currents do not create larger action potentials. Therefore, action potentials are said to be all-or-none signals, since either they occur fully or they do not occur at all. [d][e][f] This is in contrast to receptor potentials, whose amplitudes are dependent on the intensity of a stimulus. In both cases, the frequency of action potentials is correlated with the intensity of a stimulus. In sensory neurons, an external signal such as pressure, temperature, light, or sound is coupled with the opening and closing of ion channels, which in turn alter the ionic permeabilities of the membrane and its voltage. These voltage changes can again be excitatory (depolarizing) or inhibitory (hyperpolarizing) and, in some sensory neurons, their combined effects can depolarize the axon hillock enough to provoke action potentials. Some examples in humans include the olfactory receptor neuron and Meissner's corpuscle, which are critical for the sense of smell and touch, respectively. However, not all sensory neurons convert their external signals into action potentials; some do not even have an axon. Instead, they may convert the signal into the release of a neurotransmitter, or into continuous graded potentials, either of which may stimulate subsequent neuron(s) into firing an action potential. For illustration, in the human ear, hair cells convert the incoming sound into the opening and closing of mechanically gated ion channels, which may cause neurotransmitter molecules to be released. In similar manner, in the human retina, the initial photoreceptor cells and the next layer of cells (comprising bipolar cells and horizontal cells) do not produce action potentials; only some amacrine cells and the third layer, the ganglion cells, produce action potentials, which then travel up the optic nerve. In sensory neurons, action potentials result from an external stimulus. However, some excitable cells require no such stimulus to fire: They spontaneously depolarize their axon hillock and fire action potentials at a regular rate, like an internal clock. The voltage traces of such cells are known as pacemaker potentials. The cardiac pacemaker cells of the sinoatrial node in the heart provide a good example. [g] Although such pacemaker potentials have a natural rhythm, it can be adjusted by external stimuli; for instance, heart rate can be altered by pharmaceuticals as well as signals from the sympathetic and parasympathetic nerves. The external stimuli do not cause the cell's repetitive firing, but merely alter its timing. In some cases, the regulation of frequency can be more complex, leading to patterns of action potentials, such as bursting. The course of the action potential can be divided into five parts: the rising phase, the peak phase, the falling phase, the undershoot phase, and the refractory period. During the rising phase the membrane potential depolarizes (becomes more positive). The point at which depolarization stops is called the peak phase. At this stage, the membrane potential reaches a maximum. Subsequent to this, there is a falling phase. During this stage the membrane potential becomes more negative, returning towards resting potential. The undershoot, or afterhyperpolarization, phase is the period during which the membrane potential temporarily becomes more negatively charged than when at rest (hyperpolarized). Finally, the time during which a subsequent action potential is impossible or difficult to fire is called the refractory period, which may overlap with the other phases. The course of the action potential is determined by two coupled effects. First, voltage-sensitive ion channels open and close in response to changes in the membrane voltage Vm. This changes the membrane's permeability to those ions. Second, according to the Goldman equation, this change in permeability changes the equilibrium potential Em, and, thus, the membrane voltage Vm. [h] Thus, the membrane potential affects the permeability, which then further affects the membrane potential. This sets up the possibility for positive feedback, which is a key part of the rising phase of the action potential. A complicating factor is that a single ion channel may have multiple internal "gates" that respond to changes in Vm in opposite ways, or at different rates. [i] For example, although raising Vm opens most gates in the voltage-sensitive sodium channel, it also closes the channel's "inactivation gate", albeit more slowly. Hence, when Vm is raised suddenly, the sodium channels open initially, but then close due to the slower inactivation. A typical action potential begins at the axon hillock with a sufficiently strong depolarization, e.g., a stimulus that increases Vm. This depolarization is often caused by the injection of extra sodium cations into the cell; these cations can come from a wide variety of sources, such as chemical synapses, sensory neurons or pacemaker potentials. For a neuron at rest, there is a high concentration of sodium and chloride ions in the extracellular fluid compared to the intracellular fluid, while there is a high concentration of potassium ions in the intracellular fluid compared to the extracellular fluid. The difference in concentrations, which causes ions to move from a high to a low concentration, and electrostatic effects (attraction of opposite charges) are responsible for the movement of ions in and out of the neuron. The inside of a neuron has a negative charge, relative to the cell exterior, from the movement of K+ out of the cell. The neuron membrane is more permeable to K+ than to other ions, allowing this ion to selectively move out of the cell, down its concentration gradient. This concentration gradient along with potassium leak channels present on the membrane of the neuron causes an efflux of potassium ions making the resting potential close to EK ≈ –75 mV. Since Na+ ions are in higher concentrations outside of the cell, the concentration and voltage differences both drive them into the cell when Na+ channels open. Depolarization opens both the sodium and potassium channels in the membrane, allowing the ions to flow into and out of the axon, respectively. If the depolarization is small (say, increasing Vm from −70 mV to −60 mV), the outward potassium current overwhelms the inward sodium current and the membrane repolarizes back to its normal resting potential around −70 mV. However, if the depolarization is large enough, the inward sodium current increases more than the outward potassium current and a runaway condition (positive feedback) results: the more inward current there is, the more Vm increases, which in turn further increases the inward current. A sufficiently strong depolarization (increase in Vm) causes the voltage-sensitive sodium channels to open; the increasing permeability to sodium drives Vm closer to the sodium equilibrium voltage ENa≈ +55 mV. The increasing voltage in turn causes even more sodium channels to open, which pushes Vm still further towards ENa. This positive feedback continues until the sodium channels are fully open and Vm is close to ENa. The sharp rise in Vm and sodium permeability correspond to the rising phase of the action potential. The critical threshold voltage for this runaway condition is usually around −45 mV, but it depends on the recent activity of the axon. A cell that has just fired an action potential cannot fire another one immediately, since the Na+ channels have not recovered from the deactivated state. The period during which no new action potential can be fired is called the absolute refractory period. At longer times, after some but not all of the ion channels have recovered, the axon can be stimulated to produce another action potential, but with a higher threshold, requiring a much stronger depolarization, e.g., to −30 mV. The period during which action potentials are unusually difficult to evoke is called the relative refractory period. The positive feedback of the rising phase slows and comes to a halt as the sodium ion channels become maximally open. At the peak of the action potential, the sodium permeability is maximized and the membrane voltage Vm is nearly equal to the sodium equilibrium voltage ENa. However, the same raised voltage that opened the sodium channels initially also slowly shuts them off, by closing their pores; the sodium channels become inactivated. This lowers the membrane's permeability to sodium relative to potassium, driving the membrane voltage back towards the resting value. At the same time, the raised voltage opens voltage-sensitive potassium channels; the increase in the membrane's potassium permeability drives Vm towards EK. Combined, these changes in sodium and potassium permeability cause Vm to drop quickly, repolarizing the membrane and producing the "falling phase" of the action potential. The depolarized voltage opens additional voltage-dependent potassium channels, and some of these do not close right away when the membrane returns to its normal resting voltage. In addition, further potassium channels open in response to the influx of calcium ions during the action potential. The intracellular concentration of potassium ions is transiently unusually low, making the membrane voltage Vm even closer to the potassium equilibrium voltage EK. The membrane potential goes below the resting membrane potential. Hence, there is an undershoot or hyperpolarization, termed an afterhyperpolarization, that persists until the membrane potassium permeability returns to its usual value, restoring the membrane potential to the resting state. Each action potential is followed by a refractory period, which can be divided into an absolute refractory period, during which it is impossible to evoke another action potential, and then a relative refractory period, during which a stronger-than-usual stimulus is required. These two refractory periods are caused by changes in the state of sodium and potassium channel molecules. When closing after an action potential, sodium channels enter an "inactivated" state, in which they cannot be made to open regardless of the membrane potential—this gives rise to the absolute refractory period. Even after a sufficient number of sodium channels have transitioned back to their resting state, it frequently happens that a fraction of potassium channels remains open, making it difficult for the membrane potential to depolarize, and thereby giving rise to the relative refractory period. Because the density and subtypes of potassium channels may differ greatly between different types of neurons, the duration of the relative refractory period is highly variable. The absolute refractory period is largely responsible for the unidirectional propagation of action potentials along axons. At any given moment, the patch of axon behind the actively spiking part is refractory, but the patch in front, not having been activated recently, is capable of being stimulated by the depolarization from the action potential. Once an action potential has occurred at a patch of membrane, the membrane patch needs time to recover before it can fire again. At the molecular level, this absolute refractory period corresponds to the time required for the voltage-activated sodium channels to recover from inactivation, i.e., to return to their closed state. There are many types of voltage-activated potassium channels in neurons. Some of them inactivate fast (A-type currents) and some of them inactivate slowly or not inactivate at all; this variability guarantees that there will be always an available source of current for repolarization, even if some of the potassium channels are inactivated because of preceding depolarization. On the other hand, all neuronal voltage-activated sodium channels inactivate within several milliseconds during strong depolarization, thus making following depolarization impossible until a substantial fraction of sodium channels have returned to their closed state. Although it limits the frequency of firing, the absolute refractory period ensures that the action potential moves in only one direction along an axon. The currents flowing in due to an action potential spread out in both directions along the axon. However, only the unfired part of the axon can respond with an action potential; the part that has just fired is unresponsive until the action potential is safely out of range and cannot restimulate that part. In the usual orthodromic conduction, the action potential propagates from the axon hillock towards the synaptic knobs (the axonal termini); propagation in the opposite direction—known as antidromic conduction—is very rare. However, if a laboratory axon is stimulated in its middle, both halves of the axon are "fresh", i.e., unfired; then two action potentials will be generated, one traveling towards the axon hillock and the other traveling towards the synaptic knobs. In order to enable fast and efficient transduction of electrical signals in the nervous system, certain neuronal axons are covered with myelin sheaths. Myelin is a multilamellar membrane that enwraps the axon in segments separated by intervals known as nodes of Ranvier. It is produced by specialized cells: Schwann cells exclusively in the peripheral nervous system, and oligodendrocytes exclusively in the central nervous system. Myelin sheath reduces membrane capacitance and increases membrane resistance in the inter-node intervals, thus allowing a fast, saltatory movement of action potentials from node to node. [l][m][n] Myelination is found mainly in vertebrates, but an analogous system has been discovered in a few invertebrates, such as some species of shrimp. [o] Not all neurons in vertebrates are myelinated; for example, axons of the neurons comprising the autonomous nervous system are not, in general, myelinated. Action potentials cannot propagate through the membrane in myelinated segments of the axon. However, the current is carried by the cytoplasm, which is sufficient to depolarize the first or second subsequent node of Ranvier. Instead, the ionic current from an action potential at one node of Ranvier provokes another action potential at the next node; this apparent "hopping" of the action potential from node to node is known as saltatory conduction. Although the mechanism of saltatory conduction was suggested in 1925 by Ralph Lillie,[q] the first experimental evidence for saltatory conduction came from Ichiji Tasaki[r] and Taiji Takeuchi[s] and from Andrew Huxley and Robert Stämpfli. [t] By contrast, in unmyelinated axons, the action potential provokes another in the membrane immediately adjacent, and moves continuously down the axon like a wave. Comparison of the conduction velocities of myelinated and unmyelinated axons in the cat. The conduction velocity v of myelinated neurons varies roughly linearly with axon diameter d (that is, v ∝ d),[p] whereas the speed of unmyelinated neurons varies roughly as the square root (v ∝√d). [u] The red and blue curves are fits of experimental data, whereas the dotted lines are their theoretical extrapolations. The length of axons' myelinated segments is important to the success of saltatory conduction. They should be as long as possible to maximize the speed of conduction, but not so long that the arriving signal is too weak to provoke an action potential at the next node of Ranvier. In nature, myelinated segments are generally long enough for the passively propagated signal to travel for at least two nodes while retaining enough amplitude to fire an action potential at the second or third node. Thus, the safety factor of saltatory conduction is high, allowing transmission to bypass nodes in case of injury. However, action potentials may end prematurely in certain places where the safety factor is low, even in unmyelinated neurons; a common example is the branch point of an axon, where it divides into two axons. Some diseases degrade myelin and impair saltatory conduction, reducing the conduction velocity of action potentials. [w] The most well-known of these is multiple sclerosis, in which the breakdown of myelin impairs coordinated movement. Cable theory's simplified view of a neuronal fiber. The connected RC circuits correspond to adjacent segments of a passive neurite. The extracellular resistances re (the counterparts of the intracellular resistances ri) are not shown, since they are usually negligibly small; the extracellular medium may be assumed to have the same voltage everywhere. where V(x, t) is the voltage across the membrane at a time t and a position x along the length of the neuron, and where λ and τ are the characteristic length and time scales on which those voltages decay in response to a stimulus. Referring to the circuit diagram on the right, these scales can be determined from the resistances and capacitances per unit length. These time and length-scales can be used to understand the dependence of the conduction velocity on the diameter of the neuron in unmyelinated fibers. For example, the time-scale τ increases with both the membrane resistance rm and capacitance cm. As the capacitance increases, more charge must be transferred to produce a given transmembrane voltage (by the equation Q = CV); as the resistance increases, less charge is transferred per unit time, making the equilibration slower. In a similar manner, if the internal resistance per unit length ri is lower in one axon than in another (e.g., because the radius of the former is larger), the spatial decay length λ becomes longer and the conduction velocity of an action potential should increase. If the transmembrane resistance rm is increased, that lowers the average "leakage" current across the membrane, likewise causing λ to become longer, increasing the conduction velocity. Some synapses dispense with the "middleman" of the neurotransmitter, and connect the presynaptic and postsynaptic cells together. [ac] When an action potential reaches such a synapse, the ionic currents flowing into the presynaptic cell can cross the barrier of the two cell membranes and enter the postsynaptic cell through pores known as connexons. [ad] Thus, the ionic currents of the presynaptic action potential can directly stimulate the postsynaptic cell. Electrical synapses allow for faster transmission because they do not require the slow diffusion of neurotransmitters across the synaptic cleft. Hence, electrical synapses are used whenever fast response and coordination of timing are crucial, as in escape reflexes, the retina of vertebrates, and the heart. The cardiac action potential differs from the neuronal action potential by having an extended plateau, in which the membrane is held at a high voltage for a few hundred milliseconds prior to being repolarized by the potassium current as usual. [ai] This plateau is due to the action of slower calcium channels opening and holding the membrane voltage near their equilibrium potential even after the sodium channels have inactivated. Plant and fungal cells [ak] are also electrically excitable. The fundamental difference from animal action potentials is that the depolarization in plant cells is not accomplished by an uptake of positive sodium ions, but by release of negative chloride ions. [al][am][an] Together with the following release of positive potassium ions, which is common to plant and animal action potentials, the action potential in plants infers, therefore, an osmotic loss of salt (KCl), whereas the animal action potential is osmotically neutral, when equal amounts of entering sodium and leaving potassium cancel each other osmotically. The interaction of electrical and osmotic relations in plant cells [ao] indicates an osmotic function of electrical excitability in the common, unicellular ancestors of plants and animals under changing salinity conditions, whereas the present function of rapid signal transmission is seen as a younger accomplishment of metazoan cells in a more stable osmotic environment. It must be assumed that the familiar signalling function of action potentials in some vascular plants (e.g. Mimosa pudica) arose independently from that in metazoan excitable cells. Action potentials are found throughout multicellular organisms, including plants, invertebrates such as insects, and vertebrates such as reptiles and mammals. [ap] Sponges seem to be the main phylum of multicellular eukaryotes that does not transmit action potentials, although some studies have suggested that these organisms have a form of electrical signaling, too. [aq] The resting potential, as well as the size and duration of the action potential, have not varied much with evolution, although the conduction velocity does vary dramatically with axonal diameter and myelination. Given its conservation throughout evolution, the action potential seems to confer evolutionary advantages. One function of action potentials is rapid, long-range signaling within the organism; the conduction velocity can exceed 110 m/s, which is one-third the speed of sound. For comparison, a hormone molecule carried in the bloodstream moves at roughly 8 m/s in large arteries. Part of this function is the tight coordination of mechanical events, such as the contraction of the heart. A second function is the computation associated with its generation. Being an all-or-none signal that does not decay with transmission distance, the action potential has similar advantages to digital electronics. The integration of various dendritic signals at the axon hillock and its thresholding to form a complex train of action potentials is another form of computation, one that has been exploited biologically to form central pattern generators and mimicked in artificial neural networks. The study of action potentials has required the development of new experimental methods. The initial work, prior to 1955, was carried out primarily by Alan Lloyd Hodgkin and Andrew Fielding Huxley, who were, along John Carew Eccles, awarded the 1963 Nobel Prize in Physiology or Medicine for their contribution to the description of the ionic basis of nerve conduction. It focused on three goals: isolating signals from single neurons or axons, developing fast, sensitive electronics, and shrinking electrodes enough that the voltage inside a single cell could be recorded. The first problem was solved by studying the giant axons found in the neurons of the squid (Loligo forbesii and Doryteuthis pealeii, at the time classified as Loligo pealeii). [ar] These axons are so large in diameter (roughly 1 mm, or 100-fold larger than a typical neuron) that they can be seen with the naked eye, making them easy to extract and manipulate. [i][as] However, they are not representative of all excitable cells, and numerous other systems with action potentials have been studied. The second problem was addressed with the crucial development of the voltage clamp,[at] which permitted experimenters to study the ionic currents underlying an action potential in isolation, and eliminated a key source of electronic noise, the current IC associated with the capacitance C of the membrane. Since the current equals C times the rate of change of the transmembrane voltage Vm, the solution was to design a circuit that kept Vm fixed (zero rate of change) regardless of the currents flowing across the membrane. Thus, the current required to keep Vm at a fixed value is a direct reflection of the current flowing through the membrane. Other electronic advances included the use of Faraday cages and electronics with high input impedance, so that the measurement itself did not affect the voltage being measured. While glass micropipette electrodes measure the sum of the currents passing through many ion channels, studying the electrical properties of a single ion channel became possible in the 1970s with the development of the patch clamp by Erwin Neher and Bert Sakmann. For this discovery, they were awarded the Nobel Prize in Physiology or Medicine in 1991. [γ] Patch-clamping verified that ionic channels have discrete states of conductance, such as open, closed and inactivated. Several neurotoxins, both natural and synthetic, are designed to block the action potential. Tetrodotoxin from the pufferfish and saxitoxin from the Gonyaulax (the dinoflagellate genus responsible for "red tides") block action potentials by inhibiting the voltage-sensitive sodium channel;[az] similarly, dendrotoxin from the black mamba snake inhibits the voltage-sensitive potassium channel. Such inhibitors of ion channels serve an important research purpose, by allowing scientists to "turn off" specific channels at will, thus isolating the other channels' contributions; they can also be useful in purifying ion channels by affinity chromatography or in assaying their concentration. However, such inhibitors also make effective neurotoxins, and have been considered for use as chemical weapons. Neurotoxins aimed at the ion channels of insects have been effective insecticides; one example is the synthetic permethrin, which prolongs the activation of the sodium channels involved in action potentials. The ion channels of insects are sufficiently different from their human counterparts that there are few side effects in humans. Scientists of the 19th century studied the propagation of electrical signals in whole nerves (i.e., bundles of neurons) and demonstrated that nervous tissue was made up of cells, instead of an interconnected network of tubes (a reticulum). Carlo Matteucci followed up Galvani's studies and demonstrated that cell membranes had a voltage across them and could produce direct current. Matteucci's work inspired the German physiologist, Emil du Bois-Reymond, who discovered the action potential in 1843. The conduction velocity of action potentials was first measured in 1850 by du Bois-Reymond's friend, Hermann von Helmholtz. To establish that nervous tissue is made up of discrete cells, the Spanish physician Santiago Ramón y Cajal and his students used a stain developed by Camillo Golgi to reveal the myriad shapes of neurons, which they rendered painstakingly. For their discoveries, Golgi and Ramón y Cajal were awarded the 1906 Nobel Prize in Physiology. 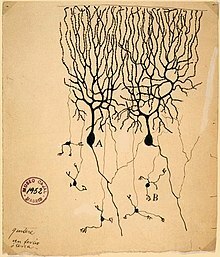 [δ] Their work resolved a long-standing controversy in the neuroanatomy of the 19th century; Golgi himself had argued for the network model of the nervous system. Equivalent electrical circuit for the Hodgkin–Huxley model of the action potential. Im and Vm represent the current through, and the voltage across, a small patch of membrane, respectively. The Cm represents the capacitance of the membrane patch, whereas the four g's represent the conductances of four types of ions. The two conductances on the left, for potassium (K) and sodium (Na), are shown with arrows to indicate that they can vary with the applied voltage, corresponding to the voltage-sensitive ion channels. The two conductances on the right help determine the resting membrane potential. ^ Note that these Purkinje fibers are muscle fibers and not related to the Purkinje cells, which are neurons found in the cerebellum. ^ Hodgkin AL, Huxley AF (1952). "A quantitative description of membrane current and its application to conduction and excitation in nerve". The Journal of Physiology. 117 (4): 500–544. doi:10.1113/jphysiol.1952.sp004764. PMC 1392413. PMID 12991237. ^ a b c d e f g h Bullock, Orkand & Grinnell 1977, pp. 150–151. ^ a b Schmidt-Nielsen 1997, p. 484. ^ Purves et al. 2008, pp. 48-49; Bullock, Orkand & Grinnell 1977, p. 141; Schmidt-Nielsen 1997, p. 483; Junge 1981, p. 89. ^ a b c d e Sanes, Dan H.; Reh, Thomas A (2012-01-01). Development of the nervous system (Third Edition). Elsevier Academic Press. pp. 211–214. ISBN 9780080923208. OCLC 762720374. ^ Partridge, Donald (1991). Calcium Channels: Their Properties, Functions, Regulation, and Clinical relevance. CRC Press. pp. 138–142. ISBN 9780849388071. ^ Black, Ira (1984). Cellular and Molecular Biology of Neuronal Development | Ira Black | Springer. Springer. p. 103. ISBN 978-1-4613-2717-2. Archived from the original on 17 July 2017. ^ Pedersen, Roger (1998). Current Topics in Developmental Biology, Volume 39. Elsevier Academic Press. ISBN 9780080584621. ^ Bullock, Orkand & Grinnell 1977, p. 11. ^ Silverthorn 2010, p. 253. ^ Purves et al. 2008, pp. 49–50; Bullock, Orkand & Grinnell 1977, pp. 140–141; Schmidt-Nielsen 1997, pp. 480-481. ^ Schmidt-Nielsen 1997, pp. 483-484. ^ Bullock, Orkand & Grinnell 1977, pp. 177–240; Schmidt-Nielsen 1997, pp. 490-499; Stevens 1966, p. 47–68. ^ Bullock, Orkand & Grinnell 1977, pp. 178–180; Schmidt-Nielsen 1997, pp. 490-491. ^ Purves et al. 2001. ^ Purves et al. 2008, pp. 26–28. ^ Schmidt-Nielsen 1997, pp. 535–580; Bullock, Orkand & Grinnell 1977, pp. 49–56, 76–93, 247–255; Stevens 1966, pp. 69–79. ^ Bullock, Orkand & Grinnell 1977, pp. 53; Bullock, Orkand & Grinnell 1977, pp. 122–124. ^ a b Bullock, Orkand & Grinnell 1977, pp. 152–153. ^ Bullock, Orkand & Grinnell 1977, pp. 444–445. ^ Purves et al. 2008, p. 38. ^ Purves et al. 2008, pp. 61–65. ^ a b Purves et al. 2008, pp. 48–49; Bullock, Orkand & Grinnell 1977, p. 141; Schmidt-Nielsen 1997, p. 483; Junge 1981, p. 89. ^ Purves et al. 2008, pp. 64–74; Bullock, Orkand & Grinnell 1977, pp. 149–150; Junge 1981, pp. 84–85; Stevens 1966, pp. 152–158. ^ a b c Purves et al. 2008, p. 47; Purves et al. 2008, p. 65; Bullock, Orkand & Grinnell 1977, pp. 147–148; Stevens 1966, p. 128. ^ Goldin, AL in Waxman 2007, Neuronal Channels and Receptors, pp. 43–58. ^ Purves et al. 2008, p. 34; Bullock, Orkand & Grinnell 1977, p. 134; Schmidt-Nielsen 1997, pp. 478–480. ^ a b Purves et al. 2008, pp. 49–50; Bullock, Orkand & Grinnell 1977, pp. 140–141; Schmidt-Nielsen 1997, pp. 480–481. ^ a b c Schmidt-Nielsen 1997, pp. 483–484. ^ a b c d Purves et al. 2008, p. 49. ^ a b c Bullock, Orkand & Grinnell 1977, p. 151; Junge 1981, pp. 4–5. ^ a b Bullock, Orkand & Grinnell 1977, p. 152. ^ Bullock, Orkand & Grinnell 1977, pp. 147–149; Stevens 1966, pp. 126–127. ^ Purves et al. 2008, p. 37. ^ a b Purves et al. 2008, p. 56. ^ Bullock, Orkand & Grinnell 1977, pp. 160–164. ^ Bullock, Orkand & Grinnell 1977, pp. 161–164. ^ Bullock, Orkand & Grinnell 1977, p. 509. ^ Schmidt-Nielsen 1997, Figure 12.13. ^ Bullock, Orkand & Grinnell 1977, p. 163. ^ Waxman, SG in Waxman 2007, Multiple Sclerosis as a Neurodegenerative Disease, pp. 333–346. ^ a b Rall, W in Koch & Segev 1989, Cable Theory for Dendritic Neurons, pp. 9–62. ^ Segev, I; Fleshman, JW; Burke, RE in Koch & Segev 1989, Compartmental Models of Complex Neurons, pp. 63–96. ^ Purves et al. 2008, pp. 52–53. ^ Gradmann, D; Mummert, H in Spanswick, Lucas & Dainty 1980, Plant action potentials, pp. 333–344. ^ Bullock & Horridge 1965. ^ Hellier, Jennifer L. (2014). The Brain, the Nervous System, and Their Diseases. ABC-Clio. p. 532. ISBN 9781610693387. ^ Snell, FM in Lavallee, Schanne & Hebert 1969, Some Electrical Properties of Fine-Tipped Pipette Microelectrodes. ^ Brazier 1961; McHenry & Garrison 1969; Worden, Swazey & Adelman 1975. ^ Baranauskas, G.; Martina, M. (2006). "Sodium Currents Activate without a Hodgkin and Huxley-Type Delay in Central Mammalian Neurons". J. Neurosci. 26 (2): 671–684. doi:10.1523/jneurosci.2283-05.2006. PMID 16407565. ^ Sato, S; Fukai, H; Nomura, T; Doi, S in Reeke et al. 2005, Bifurcation Analysis of the Hodgkin-Huxley Equations, pp. 459–478. * FitzHugh, R in Schwann 1969, Mathematical models of axcitation and propagation in nerve, pp. 12–16. ^ Nelson, ME; Rinzel, J in Bower & Beeman 1995, The Hodgkin-Huxley Model, pp. 29–49. * Rinzel, J & Ermentrout, GB; in Koch & Segev 1989, Analysis of Neural Excitability and Oscillations, pp. 135–169. ^ McCulloch 1988, pp. 19–39, 46–66, 72–141; Anderson & Rosenfeld 1988, pp. 15–41. ^ Getting, PA in Koch & Segev 1989, Reconstruction of Small Neural Networks, pp. 171–194. Anderson, JA; Rosenfeld, E, eds. (1988). Neurocomputing: Foundations of Research. Cambridge, Massachusetts: The MIT Press. ISBN 978-0-262-01097-9. LCCN 87003022. OCLC 15860311. Bernstein, J (1912). Elektrobiologie, die Lehre von den elektrischen Vorgängen im Organismus auf moderner Grundlage dargestellt [Electric Biology, the study of the electrical processes in the organism represented on a modern basis]. Braunschweig: Vieweg und Sohn. LCCN 12027986. OCLC 11358569. Bower, JM; Beeman, D (1995). The Book of GENESIS: Exploring Realistic Neural Models with the GEneral NEural SImulation System. Santa Clara, Calif.: TELOS. ISBN 978-0-387-94019-9. LCCN 94017624. OCLC 30518469. Brazier, MAB (1961). A History of the Electrical Activity of the Brain. London: Pitman. LCCN 62001407. OCLC 556863. Bullock, TH; Horridge, GA (1965). Structure and Function in the Nervous Systems of Invertebrates. A series of books in biology. San Francisco: W. H. Freeman. LCCN 65007965. OCLC 558128. Bullock, TH; Orkand, R; Grinnell, A (1977). Introduction to Nervous Systems. A series of books in biology. San Francisco: W. H. Freeman. ISBN 978-0-7167-0030-2. LCCN 76003735. OCLC 2048177. Field, J (ed.). Handbook of Physiology: a Critical, Comprehensive Presentation of Physiological Knowledge and Concepts: Section 1: Neurophysiology. 1. Washington, DC: American Physiological Society. LCCN 60004587. OCLC 830755894. Ganong, WF (1991). Review of Medical Physiology (15th ed.). Norwalk, Conn.: Appleton and Lange. ISBN 978-0-8385-8418-7. ISSN 0892-1253. LCCN 87642343. OCLC 23761261. Guckenheimer, J; Holmes, P (1986). Nonlinear Oscillations, Dynamical Systems and Bifurcations of Vector Fields. Applied Mathematical Sciences. 42 (2nd ed.). New York: Springer Verlag. ISBN 978-0-387-90819-9. OCLC 751129941. Hoppensteadt, FC (1986). An Introduction to the Mathematics of Neurons. Cambridge studies in mathematical biology. 6. Cambridge: Cambridge University Press. ISBN 978-0-521-31574-6. LCCN 85011013. OCLC 12052275. Junge, D (1981). Nerve and Muscle Excitation (2nd ed.). Sunderland, Mass. : Sinauer Associates. ISBN 978-0-87893-410-2. LCCN 80018158. OCLC 6486925. Kettenmann, H; Grantyn, R, eds. (1992). Practical Electrophysiological Methods: A Guide for In Vitro Studies in Vertebrate Neurobiology. New York: Wiley. ISBN 978-0-471-56200-9. LCCN 92000179. OCLC 25204689. Keynes, RD; Aidley, DJ (1991). Nerve and Muscle (2nd ed.). Cambridge: Cambridge University Press. ISBN 978-0-521-41042-7. LCCN 90015167. OCLC 25204483. Koch, C; Segev, I, eds. (1989). Methods in Neuronal Modeling: From Synapses to Networks. Cambridge, Massachusetts: The MIT Press. ISBN 978-0-262-11133-1. LCCN 88008279. OCLC 18384545. Lavallée, M; Schanne, OF; Hébert, NC, eds. (1969). Glass Microelectrodes. New York: Wiley. ISBN 978-0-471-51885-3. LCCN 68009252. OCLC 686. McCulloch, WS (1988). Embodiments of Mind. Cambridge, Massachusetts: The MIT Press. ISBN 978-0-262-63114-3. LCCN 88002987. OCLC 237280. McHenry, LC; Garrison, FH (1969). Garrison's History of Neurology. Springfield, Ill.: Charles C. Thomas. OCLC 429733931. Silverthorn, DU (2010). Human Physiology: An Integrated Approach (5th ed.). San Francisco: Pearson. ISBN 978-0-321-55980-7. LCCN 2008050369. OCLC 268788623. Spanswick, RM; Lucas, WJ; Dainty, J, eds. (1980). Plant Membrane Transport: Current Conceptual Issues. Developments in Plant Biology. 4. Amsterdam: Elsevier Biomedical Press. ISBN 978-0-444-80192-0. LCCN 79025719. OCLC 5799924. Purves, D; Augustine, GJ; Fitzpatrick, D; Hall, WC; Lamantia, A-S; McNamara, JO; Williams, SM (2001). "Release of Transmitters from Synaptic Vesicles". Neuroscience (2nd ed.). Sunderland, MA: Sinauer Associates. ISBN 978-0-87893-742-4. LCCN 00059496. OCLC 806472664. Purves, D; Augustine, GJ; Fitzpatrick, D; Hall, WC; Lamantia, A-S; McNamara, JO; White, LE (2008). Neuroscience (4th ed.). Sunderland, MA: Sinauer Associates. ISBN 978-0-87893-697-7. LCCN 2007024950. OCLC 144771764. Reeke, GN; Poznanski, RR; Sporns, O; Rosenberg, JR; Lindsay, KA, eds. (2005). Modeling in the Neurosciences: from Biological Systems to Neuromimetic Robotics. Boca Raton, Fla.: Taylor & Francis. ISBN 978-0-415-32868-5. LCCN 2005298022. OCLC 489024131. Schmidt-Nielsen, K (1997). Animal Physiology: Adaptation and Environment (5th ed.). Cambridge: Cambridge University Press. ISBN 978-0-521-57098-5. LCCN 96039295. OCLC 35744403. Schwann, HP, ed. (1969). Biological Engineering. Inter-University Electronics Series. 9. New York: McGraw-Hill. ISBN 978-0-07-055734-5. LCCN 68027513. OCLC 51993. Stevens, CF (1966). Neurophysiology: A Primer. New York: John Wiley and Sons. LCCN 66015872. OCLC 1175605. Waxman, SG, ed. (2007). Molecular Neurology. Burlington, Mass. : Elsevier Academic Press. ISBN 978-0-12-369509-3. LCCN 2008357317. OCLC 154760295. Worden, FG; Swazey, JP; Adelman, G, eds. (1975). The Neurosciences, Paths of Discovery. Cambridge, Massachusetts: The MIT Press. ISBN 978-0-262-23072-8. LCCN 75016379. OCLC 1500233. ^ MacDonald PE, Rorsman P (February 2006). "Oscillations, intercellular coupling, and insulin secretion in pancreatic beta cells". PLoS Biol. 4 (2): e49. doi:10.1371/journal.pbio.0040049. PMC 1363709. PMID 16464129. ^ a b Barnett MW; Larkman PM (June 2007). "The action potential". Pract Neurol. 7 (3): 192–7. PMID 17515599. Archived from the original on 8 July 2011. ^ Golding NL, Kath WL, Spruston N (December 2001). "Dichotomy of action-potential backpropagation in CA1 pyramidal neuron dendrites". J. Neurophysiol. 86 (6): 2998–3010. PMID 11731556. Archived from the original on 22 November 2008. ^ Aur, D.; Connolly, C.I. ; Jog, M.S. (2005). "Computing spike directivity with tetrodes". Journal of Neuroscience Methods. 149 (1): 57–63. doi:10.1016/j.jneumeth.2005.05.006. PMID 15978667. ^ Noble D (1960). "Cardiac action and pacemaker potentials based on the Hodgkin-Huxley equations". Nature. 188 (4749): 495–497. Bibcode:1960Natur.188..495N. doi:10.1038/188495b0. PMID 13729365. ^ a b Goldman DE (1943). "Potential, impedance and rectification in membranes". J. Gen. Physiol. 27 (1): 37–60. doi:10.1085/jgp.27.1.37. PMC 2142582. PMID 19873371. ^ a b c d e Hodgkin AL, Huxley AF, Katz B (1952). "Measurements of current-voltage relations in the membrane of the giant axon of Loligo". Journal of Physiology. 116 (4): 424–448. doi:10.1113/jphysiol.1952.sp004716. PMC 1392219. PMID 14946712. * Hodgkin AL (1952). "Currents carried by sodium and potassium ions through the membrane of the giant axon of Loligo". Journal of Physiology. 116 (4): 449–472. doi:10.1113/jphysiol.1952.sp004717. PMC 1392213. PMID 14946713. * Hodgkin AL (1952). "The components of membrane conductance in the giant axon of Loligo". J Physiol. 116 (4): 473–496. doi:10.1113/jphysiol.1952.sp004718. PMC 1392209. PMID 14946714. * Hodgkin AL, Huxley (1952). "The dual effect of membrane potential on sodium conductance in the giant axon of Loligo". J Physiol. 116 (4): 497–506. doi:10.1113/jphysiol.1952.sp004719. PMC 1392212. PMID 14946715. * Hodgkin AL, Huxley (1952). "A quantitative description of membrane current and its application to conduction and excitation in nerve". J Physiol. 117 (4): 500–544. doi:10.1113/jphysiol.1952.sp004764. PMC 1392413. PMID 12991237. ^ Naundorf B, Wolf F, Volgushev M (April 2006). "Unique features of action potential initiation in cortical neurons" (Letter). Nature. 440 (7087): 1060–1063. Bibcode:2006Natur.440.1060N. doi:10.1038/nature04610. PMID 16625198. Archived from the original on 3 March 2008. Retrieved 27 March 2008. ^ Hodgkin AL (1937). "Evidence for electrical transmission in nerve, Part I". Journal of Physiology. 90 (2): 183–210. PMC 1395060. PMID 16994885. ^ Zalc B (2006). "The acquisition of myelin: a success story". Novartis Found. Symp. Novartis Foundation Symposia. 276: 15–21, discussion 21–5, 54–7, 275–81. doi:10.1002/9780470032244.ch3. ISBN 978-0-470-03224-4. PMID 16805421. ^ S. Poliak; E. Peles (2006). "The local differentiation of myelinated axons at nodes of Ranvier". Nature Reviews Neuroscience. 4: 968–80. doi:10.1038/nrn1253. PMID 14682359. ^ Simons M, Trotter J (October 2007). "Wrapping it up: the cell biology of myelination". Curr. Opin. Neurobiol. 17 (5): 533–40. doi:10.1016/j.conb.2007.08.003. PMID 17923405. ^ Xu K, Terakawa S (1 August 1999). "Fenestration nodes and the wide submyelinic space form the basis for the unusually fast impulse conduction of shrimp myelinated axons". J. Exp. Biol. 202 (Pt 15): 1979–89. PMID 10395528. ^ a b Hursh JB (1939). "Conduction velocity and diameter of nerve fibers". American Journal of Physiology. 127: 131–39. ^ Lillie RS (1925). "Factors affecting transmission and recovery in passive iron nerve model". J. Gen. Physiol. 7 (4): 473–507. doi:10.1085/jgp.7.4.473. PMC 2140733. PMID 19872151. See also Keynes and Aidley, p. 78. ^ Tasaki I (1939). "Electro-saltatory transmission of nerve impulse and effect of narcosis upon nerve fiber". Am. J. Physiol. 127: 211–27. ^ Tasaki I, Takeuchi T (1941). "Der am Ranvierschen Knoten entstehende Aktionsstrom und seine Bedeutung für die Erregungsleitung". Pflügers Archiv für die gesamte Physiologie. 244 (6): 696–711. doi:10.1007/BF01755414. * Tasaki I, Takeuchi T (1942). "Weitere Studien über den Aktionsstrom der markhaltigen Nervenfaser und über die elektrosaltatorische Übertragung des nervenimpulses". Pflügers Archiv für die gesamte Physiologie. 245 (5): 764–82. doi:10.1007/BF01755237. ^ Huxley A (1949). "Evidence for saltatory conduction in peripheral myelinated nerve-fibers". Journal of Physiology. 108 (3): 315–39. doi:10.1113/jphysiol.1949.sp004335. PMC 1392492. PMID 16991863. * Huxley A (1949). "Direct determination of membrane resting potential and action potential in single myelinated nerve fibers". Journal of Physiology. 112 (3–4): 476–95. PMC 1393015. PMID 14825228. ^ Rushton WAH (1951). "A theory of the effects of fibre size in the medullated nerve". Journal of Physiology. 115 (1): 101–22. PMC 1392008. PMID 14889433. ^ a b Hartline DK, Colman DR (2007). "Rapid conduction and the evolution of giant axons and myelinated fibers". Curr. Biol. 17 (1): R29–R35. doi:10.1016/j.cub.2006.11.042. PMID 17208176. ^ Miller RH, Mi S (2007). "Dissecting demyelination". Nat. Neurosci. 10 (11): 1351–54. doi:10.1038/nn1995. PMID 17965654. ^ Kelvin WT (1855). "On the theory of the electric telegraph". Proceedings of the Royal Society. 7: 382–99. doi:10.1098/rspl.1854.0093. ^ Hodgkin AL (1946). "The electrical constants of a crustacean nerve fibre". Proceedings of the Royal Society B. 133 (873): 444–79. Bibcode:1946RSPSB.133..444H. doi:10.1098/rspb.1946.0024. PMID 20281590. ^ Süudhof TC (2008). "Neurotransmitter release". Handb Exp Pharmacol. Handbook of Experimental Pharmacology. 184 (184): 1–21. doi:10.1007/978-3-540-74805-2_1. ISBN 978-3-540-74804-5. PMID 18064409. ^ Rusakov DA (August 2006). "Ca2+-dependent mechanisms of presynaptic control at central synapses". Neuroscientist. 12 (4): 317–26. doi:10.1177/1073858405284672. PMC 2684670. PMID 16840708. ^ Zoidl G, Dermietzel R (2002). "On the search for the electrical synapse: a glimpse at the future". Cell Tissue Res. 310 (2): 137–42. doi:10.1007/s00441-002-0632-x. PMID 12397368. ^ Brink PR, Cronin K, Ramanan SV (1996). "Gap junctions in excitable cells". J. Bioenerg. Biomembr. 28 (4): 351–8. doi:10.1007/BF02110111. PMID 8844332. ^ Hirsch NP (July 2007). "Neuromuscular junction in health and disease". Br J Anaesth. 99 (1): 132–8. doi:10.1093/bja/aem144. PMID 17573397. Archived from the original on 16 July 2012. ^ Hughes BW, Kusner LL, Kaminski HJ (April 2006). "Molecular architecture of the neuromuscular junction". Muscle Nerve. 33 (4): 445–61. doi:10.1002/mus.20440. PMID 16228970. ^ a b Newmark J (2007). "Nerve agents". Neurologist. 13 (1): 20–32. doi:10.1097/01.nrl.0000252923.04894.53. PMID 17215724. ^ Costa LG (2006). "Current issues in organophosphate toxicology". Clin. Chim. Acta. 366 (1–2): 1–13. doi:10.1016/j.cca.2005.10.008. PMID 16337171. ^ a b c Kléber AG, Rudy Y (April 2004). "Basic mechanisms of cardiac impulse propagation and associated arrhythmias". Physiol. Rev. 84 (2): 431–88. doi:10.1152/physrev.00025.2003. PMID 15044680. ^ Tamargo J, Caballero R, Delpón E (January 2004). "Pharmacological approaches in the treatment of atrial fibrillation". Curr. Med. Chem. 11 (1): 13–28. doi:10.2174/0929867043456241. PMID 14754423. ^ Slayman CL, Long WS, Gradmann D (1976). "Action potentials in Neurospora crassa, a mycelial fungus". Biochimica et Biophysica Acta. 426 (4): 737–744. doi:10.1016/0005-2736(76)90138-3. PMID 130926. ^ Mummert H, Gradmann D (1991). "Action potentials in Acetabularia: measurement and simulation of voltage-gated fluxes". Journal of Membrane Biology. 124 (3): 265–273. doi:10.1007/BF01994359. PMID 1664861. ^ Beilby MJ (2007). "Action potentials in charophytes". Int. Rev. Cytol. International Review of Cytology. 257: 43–82. doi:10.1016/S0074-7696(07)57002-6. ISBN 978-0-12-373701-4. PMID 17280895. ^ Gradmann D, Hoffstadt J (1998). "Electrocoupling of ion transporters in plants: Interaction with internal ion concentrations". Journal of Membrane Biology. 166 (1): 51–59. doi:10.1007/s002329900446. PMID 9784585. ^ Fromm J, Lautner S (2007). "Electrical signals and their physiological significance in plants". Plant Cell Environ. 30 (3): 249–257. doi:10.1111/j.1365-3040.2006.01614.x. PMID 17263772. ^ Leys SP, Mackie GO, Meech RW (1 May 1999). "Impulse conduction in a sponge". J. Exp. Biol. 202 (9): 1139–50. PMID 10101111. ^ Keynes RD (1989). "The role of giant axons in studies of the nerve impulse". BioEssays. 10 (2–3): 90–93. doi:10.1002/bies.950100213. PMID 2541698. ^ Meunier C, Segev I (2002). "Playing the devil's advocate: is the Hodgkin-Huxley model useful?". Trends Neurosci. 25 (11): 558–63. doi:10.1016/S0166-2236(02)02278-6. PMID 12392930. ^ Cole KS (1949). "Dynamic electrical characteristics of the squid axon membrane". Arch. Sci. Physiol. 3: 253–8. ^ Ling G, Gerard RW (1949). "The normal membrane potential of frog sartorius fibers". J. Cell. Comp. Physiol. 34 (3): 383–396. doi:10.1002/jcp.1030340304. PMID 15410483. ^ Nastuk WL (1950). "The electrical activity of single muscle fibers". J. Cell. Comp. Physiol. 35: 39–73. doi:10.1002/jcp.1030350105. ^ Brock LG, Coombs JS, Eccles JC (1952). "The recording of potentials from motoneurones with an intracellular electrode". J. Physiol. 117: 431–460. doi:10.1113/jphysiol.1952.sp004759. PMC 1392415. PMID 12991232. ^ Ross WN, Salzberg BM, Cohen LB, Davila HV (1974). "A large change in dye absorption during the action potential". Biophysical Journal. 14 (12): 983–986. Bibcode:1974BpJ....14..983R. doi:10.1016/S0006-3495(74)85963-1. PMC 1334592. PMID 4429774. * Grynkiewicz G, Poenie M, Tsien RY (1985). "A new generation of Ca2+ indicators with greatly improved fluorescence properties". J. Biol. Chem. 260 (6): 3440–3450. PMID 3838314. ^ Bu G, Adams H, Berbari EJ, Rubart M (March 2009). "Uniform action potential repolarization within the sarcolemma of in situ ventricular cardiomyocytes". Biophys. J. 96 (6): 2532–46. Bibcode:2009BpJ....96.2532B. doi:10.1016/j.bpj.2008.12.3896. PMC 2907679. PMID 19289075. ^ Nakamura Y, Nakajima S, Grundfest H (1965). "The effect of tetrodotoxin on electrogenic components of squid giant axons". J. Gen. Physiol. 48 (6): 985–996. doi:10.1085/jgp.48.6.975. PMC 2195447. PMID 5855511. * Ritchie JM, Rogart RB (1977). "The binding of saxitoxin and tetrodotoxin to excitable tissue". Rev. Physiol. Biochem. Pharmacol. Reviews of Physiology, Biochemistry and Pharmacology. 79: 1–50. doi:10.1007/BFb0037088. ISBN 0-387-08326-X. PMID 335473. * Keynes RD, Ritchie JM (1984). "On the binding of labelled saxitoxin to the squid giant axon". Proc. R. Soc. Lond. 239 (1227): 393–434. Bibcode:1984RSPSB.222..147K. doi:10.1098/rspb.1984.0055. ^ Piccolino M (1997). "Luigi Galvani and animal electricity: two centuries after the foundation of electrophysiology". Trends in Neurosciences. 20 (10): 443–448. doi:10.1016/S0166-2236(97)01101-6. ^ Piccolino M (2000). "The bicentennial of the Voltaic battery (1800–2000): the artificial electric organ". Trends in Neurosciences. 23 (4): 147–151. doi:10.1016/S0166-2236(99)01544-1. ^ Bernstein J (1902). "Untersuchungen zur Thermodynamik der bioelektrischen Ströme". Pflügers Archiv für die gesamte Physiologie. 92 (10–12): 521–562. doi:10.1007/BF01790181. ^ Cole KS (1939). "Electrical impedance of the squid giant axon during activity". J. Gen. Physiol. 22 (5): 649–670. doi:10.1085/jgp.22.5.649. PMC 2142006. PMID 19873125. ^ Lapicque L (1907). "Recherches quantitatives sur l'excitationelectrique des nerfs traitee comme une polarisation". J. Physiol. Pathol. Gen. 9: 620–635. ^ Hodgkin AL, Katz B (1949). "The effect of sodium ions on the electrical activity of the giant axon of the squid". Journal of Physiology. 108: 37–77. doi:10.1113/jphysiol.1949.sp004310. PMC 1392331. ^ Neher E, Sakmann (1976). "Single-channel currents recorded from membrane of denervated frog muscle fibres". Nature. 260 (5554): 779–802. Bibcode:1976Natur.260..799N. doi:10.1038/260799a0. PMID 1083489. * Hamill OP (1981). "Improved patch-clamp techniques for high-resolution current recording from cells and cell-free membrane patches". Pflügers Arch. 391 (2): 85–100. doi:10.1007/BF00656997. PMID 6270629. * Neher E (1992). "The patch clamp technique". Scientific American. 266 (3): 44–51. Bibcode:1992SciAm.266c..44N. doi:10.1038/scientificamerican0392-44. PMID 1374932. ^ Yellen G (2002). "The voltage-gated potassium channels and their relatives". Nature. 419 (6902): 35–42. doi:10.1038/nature00978. PMID 12214225. ^ Doyle DA; Morais Cabral J; Pfuetzner RA; Kuo A; Gulbis JM; Cohen SL; et al. (1998). "The structure of the potassium channel, molecular basis of K+ conduction and selectivity". Science. 280 (5360): 69–77. Bibcode:1998Sci...280...69D. doi:10.1126/science.280.5360.69. PMID 9525859. * Zhou Y, Morias-Cabrak JH, Kaufman A, MacKinnon R (2001). "Chemistry of ion coordination and hydration revealed by a K+-Fab complex at 2.0 A resolution". Nature. 414 (6859): 43–48. Bibcode:2001Natur.414...43Z. doi:10.1038/35102009. PMID 11689936. * Jiang Y, Lee A, Chen J, Ruta V, Cadene M, Chait BT, MacKinnon R (2003). "X-ray structure of a voltage-dependent K+ channel". Nature. 423 (6935): 33–41. Bibcode:2003Natur.423...33J. doi:10.1038/nature01580. PMID 12721618. ^ Cha A, Snyder GE, Selvin PR, Bezanilla F (1999). "Atomic-scale movement of the voltage-sensing region in a potassium channel measured via spectroscopy". Nature. 402 (6763): 809–813. doi:10.1038/45552. PMID 10617201. * Glauner KS, Mannuzzu LM, Gandhi CS, Isacoff E (1999). "Spectroscopic mapping of voltage sensor movement in the Shaker potassium channel". Nature. 402 (6763): 813–817. Bibcode:1999Natur.402..813G. doi:10.1038/45561. PMID 10617202. ^ Catterall WA (2001). "A 3D view of sodium channels". Nature. 409 (6823): 988–999. Bibcode:2001Natur.409..988C. doi:10.1038/35059188. PMID 11234048. * Sato C; Ueno Y; Asai K; Takahashi K; Sato M; Engel A; et al. (2001). "The voltage-sensitive sodium channel is a bell-shaped molecule with several cavities". Nature. 409 (6823): 1047–1051. Bibcode:2001Natur.409.1047S. doi:10.1038/35059098. PMID 11234014. ^ Skou J (1957). "The influence of some cations on an adenosine triphosphatase from peripheral nerves". Biochim Biophys Acta. 23 (2): 394–401. doi:10.1016/0006-3002(57)90343-8. PMID 13412736. ^ Hodgkin AL, Keynes (1955). "Active transport of cations in giant axons from Sepia and Loligo". J. Physiol. 128 (1): 28–60. doi:10.1113/jphysiol.1955.sp005290. PMC 1365754. PMID 14368574. ^ Caldwell PC, Hodgkin, Keynes, Shaw (1960). "The effects of injecting energy-rich phosphate compounds on the active transport of ions in the giant axons of Loligo". J. Physiol. 152 (3): 561–90. doi:10.1113/jphysiol.1960.sp006509. PMC 1363339. PMID 13806926. ^ Caldwell PC, Keynes RD (1957). "The utilization of phosphate bond energy for sodium extrusion from giant axons". J. Physiol. 137 (1): 12–13P. doi:10.1113/jphysiol.1957.sp005830. PMID 13439598. ^ Morth JP, Pedersen PB, Toustrup-Jensen MS, Soerensen TL, Petersen J, Andersen JP, Vilsen B, Nissen P (2007). "Crystal structure of the sodium–potassium pump". Nature. 450 (7172): 1043–1049. Bibcode:2007Natur.450.1043M. doi:10.1038/nature06419. PMID 18075585. ^ Lee AG, East JM (2001). "What the structure of a calcium pump tells us about its mechanism". Biochemical Journal. 356 (Pt 3): 665–683. doi:10.1042/0264-6021:3560665. PMC 1221895. PMID 11389676. ^ * FitzHugh R (1960). "Thresholds and plateaus in the Hodgkin-Huxley nerve equations". J. Gen. Physiol. 43 (5): 867–896. doi:10.1085/jgp.43.5.867. PMC 2195039. PMID 13823315. * Kepler TB, Abbott LF, Marder E (1992). "Reduction of conductance-based neuron models". Biological Cybernetics. 66 (5): 381–387. doi:10.1007/BF00197717. PMID 1562643. ^ Morris C, Lecar H (1981). "Voltage oscillations in the barnacle giant muscle fiber". Biophysical Journal. 35 (1): 193–213. Bibcode:1981BpJ....35..193M. doi:10.1016/S0006-3495(81)84782-0. PMC 1327511. PMID 7260316. ^ FitzHugh R (1961). "Impulses and physiological states in theoretical models of nerve membrane". Biophysical Journal. 1 (6): 445–466. Bibcode:1961BpJ.....1..445F. doi:10.1016/S0006-3495(61)86902-6. PMC 1366333. PMID 19431309. * Nagumo J, Arimoto S, Yoshizawa S (1962). "An active pulse transmission line simulating nerve axon". Proceedings of the IRE. 50 (10): 2061–2070. doi:10.1109/JRPROC.1962.288235. ^ Bonhoeffer KF (1948). "Activation of Passive Iron as a Model for the Excitation of Nerve". J. Gen. Physiol. 32 (1): 69–91. doi:10.1085/jgp.32.1.69. PMC 2213747. PMID 18885679. * Bonhoeffer KF (1953). "Modelle der Nervenerregung". Naturwissenschaften. 40 (11): 301–311. Bibcode:1953NW.....40..301B. doi:10.1007/BF00632438. * van der Pol B, van der Mark J (1928). "The heartbeat considered as a relaxation oscillation, and an electrical model of the heart". Philosophical Magazine. 6: 763–775. doi:10.1080/14786441108564652. ^ Evans JW (1972). "Nerve axon equations. I. Linear approximations". Indiana U. Math. Journal. 21 (9): 877–885. doi:10.1512/iumj.1972.21.21071. ^ Keener JP (1983). "Analogue circuitry for the van der Pol and FitzHugh-Nagumo equations". IEEE Trans. on Systems, Man and Cybernetics. 13 (5): 1010–1014. doi:10.1109/TSMC.1983.6313098. ^ Hooper SL (March 2000). "Central pattern generators". Curr. Biol. 10 (5): R176. CiteSeerX 10.1.1.133.3378. doi:10.1016/S0960-9822(00)00367-5. PMID 10713861. ^ "FitzHugh-Nagumo model". Archived from the original on 3 June 2014. Retrieved 24 May 2014. ^ "The Nobel Prize in Physiology or Medicine 1963" (Press release). The Royal Swedish Academy of Science. 1963. Archived from the original on 16 July 2007. Retrieved 21 February 2010. ^ "The Nobel Prize in Physiology or Medicine 1991" (Press release). The Royal Swedish Academy of Science. 1991. Archived from the original on 24 March 2010. Retrieved 21 February 2010. ^ "The Nobel Prize in Physiology or Medicine 1906" (Press release). The Royal Swedish Academy of Science. 1906. Archived from the original on 4 December 2008. Retrieved 21 February 2010. ^ Warlow, Charles. "The Recent Evolution of a Symbiotic Ion Channel in the Legume Family Altered Ion Conductance and Improved Functionality in Calcium Signaling". BMJ Publishing Group. Archived from the original on 14 March 2012. Retrieved 23 March 2013. ^ "The Nobel Prize in Chemistry 1997" (Press release). The Royal Swedish Academy of Science. 1997. Archived from the original on 23 October 2009. Retrieved 21 February 2010. Clay JR (May 2005). "Axonal excitability revisited". Prog Biophys Mol Biol. 88 (1): 59–90. doi:10.1016/j.pbiomolbio.2003.12.004. PMID 15561301. Hille B (2001). Ion Channels of Excitable Membranes (3rd ed.). Sunderland, MA: Sinauer Associates. ISBN 978-0-87893-321-1. Johnston D; Wu SM-S (1995). Foundations of Cellular Neurophysiology. Cambridge, Massachusetts: Bradford Book, The MIT Press. ISBN 0-262-10053-3. Kandel ER, Schwartz JH, Jessell TM (2000). Principles of Neural Science (4th ed.). New York: McGraw-Hill. ISBN 0-8385-7701-6. Miller C (1987). "How ion channel proteins work". In LK Kaczmarek; IB Levitan. Neuromodulation: The Biochemical Control of Neuronal Excitability. New York: Oxford University Press. pp. 39–63. ISBN 978-0-19-504097-5.